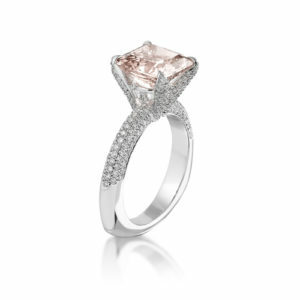 Now that you are engaged (or about to be) your mind naturally turns to rings and, in most cases, diamonds! The term “conflict-free diamonds” has been thrown about a lot in the last 20 years, but what are they? Is there only one very rare and expensive source for them? How can you make sure that you have ethically sourced diamonds for your rings? What does the phrase “conflict-free diamonds” mean? Is there only one source for conflict-free diamonds? No, not at all. At this point 99 percent of all rough diamonds that are traded are certified conflict-free. That certification is done through the Kimberley Process, which was established by the United Nations in 2002. But there are still conflict diamonds out there so it is important to go with a reputable dealer like Dominion Jewelers. How can you make sure that you have ethically sourced diamonds? Ask your jeweler if they use KP-certified diamonds. If you don’t get a firm “yes,” move on and find someone who will answer your question outright. At Dominion Jewelers, we only work with diamonds from sources that are certified by the Kimberley Process. We are more than happy to discuss the heritage of those diamonds. Another option is by using a diamond you already have. You can restyle an heirloom ring that has been passed down but may not exactly be your style. It is also an option to take a diamond, or multiple diamonds, from another jewelry piece and have them put into a custom setting just for you. The original sourcing of these diamonds may not be known but you can take comfort knowing that you are making the most of an existing piece and can hold on to the sentiment from that family love. Conflict-free diamonds are still in the market today and should be avoided. Start your marriage with a piece of jewelry that you have ethically sourced and that gives you nothing but peace of mind when you look at it for decades to come.